Cold coffee with a kick of chocolate syrup and smoothness of whipped cream, Choco-Cream Frappe can be found around most cafés and coffee shops and is a favourite among youngsters. And now with this easy recipe, you can make it easily at home. This is a great way to make kids enjoy their milk and is a refreshing drink any time of the day. Perfect for breakfast or as an evening snack. Put the milk, sugar, cream and coffee in a mixer and blend until smooth. Tip: You can also choose not the blend the cream but drop a dollop of it in the glass before or after pouring the cold coffee. Tilt the serving glasses and run the chocolate syrup directly from the bottle or with a flat spoon along the inner surface of the glass. Pour the chilled cold coffee into the glasses. Serve! Tip: If the milk is not cold enough, you could also use a little crushed ice. However, using ice in cold coffee generally affects the taste since it adds some water as the ice melts. It seems yummy and to make it yummiest you can also add a scoop of vanilla ice-cream with chocolate syrup on it. Very true! 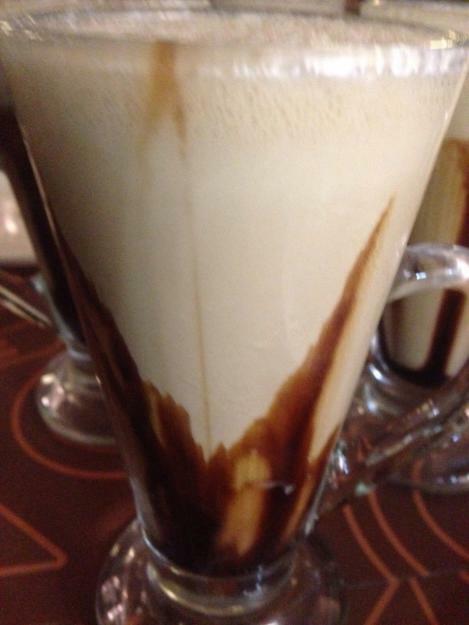 Thank you for that lovely suggestion.. if you happen to try that sometime, do drop in a picture of the awesome drink!